Why not spend Easter in London this year? With over 20 daily flights from Geneva, a holiday or short-break in London is always a great idea, with or without the kids. Céline has compiled a list of great family-friendly events coming up during these Easter holidays, if you fancy the idea of hopping on a plane and heading to the British capital this spring! 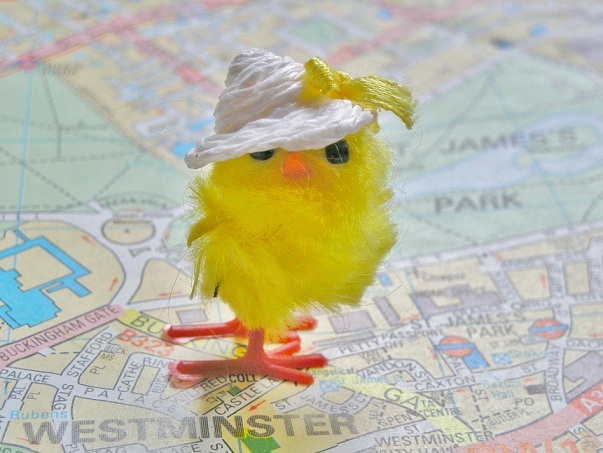 OUTDOOR EASTER FUN – Don’t forget your umbrella! This annual event takes place every Easter and attracts over 600 skaters/roller bladers. Open to all skill levels and for all ages, it’s a great opportunity to discover Hyde Park and make the most of free skating lessons as well! Nearest tube station: Hyde Park Corner. Families will be solving riddles and looking for clues around the square with a chance to enter a fabulous prize draw, shake hands with Easter costume characters and eat as many chocolate eggs as they can throughout the day. The Saatchi Gallery is on Duke of York Square and regularly hosts free exhibitions. It offers an interesting and playful display of contemporary art. Free entry. Raising funds for the charity ‘Action for Childen’, this is the biggest Egg Hunt in the world. The 101 giant eggs – all of them uniquely crafted and designed – will be auctioned after the egg hunt. An 8 metre Lindt inflatable giant bunny from Switzerland will also be parading the streets of Covent Garden. The annual egg hunt where children find hidden tokens that can be exchanged for chocolate eggs takes place at Kew Gardens on Sunday 31st March 2013. I can’t think of a most beautiful setting for an Easter egg hunt on a sunny spring day! Nearest tube station: Kew Gardens. 5) Celebrate Easter with real bunnies at BATTERSEA PARK ZOO – from the 29th of March to the 1st of April 2013. Egg-hunt your way through this cute and lovingly-kept small zoo, perfect for very young children. 1) Earn an Egg at the BANK OF ENGLAND EASTER EGGCITEMENT– from the 2nd to the 5th of April 2013 & from the 8th to the 12th of April 2013. Invest your time wisely and you might get an egg-nest! The whole family will enjoy the treasure trails and Easter crafts organized by the Bank of England museum. The museum promises an egg for every child…what do you reckon, will it a gold or a chocolate one? 2) Have a very Sharky Easter at the LONDON SEALIFE AQUARIUM – from the 31st of March to the 15th of April 2013. The London Aquarium is the place to visit to discover a very different type of eggs this Easter: real shark and manta-ray eggs! A number of great activities, talks and feeds are planned throughout the Easter holidays. Nearest tube station: Westminster or Waterloo. 3) Bad Egg Easter at THE LONDON DUNGEON – from the 29th of March to the 14th of April 2013. If you thought Easter couldn’t possibly be scary or if your little monsters fancy a goth Easter, book your tickets for the Bad Eggs Easter Hunt! Free chocolate eggs for the first 100 visitors every day. Go on, if you dare. Nearest tube: Westminster or Waterloo. 4) Egg-tastic Easter fun at the V&A MUSEUM OF CHILDHOOD – from the 29th of March to the 1st of April 2013. Enjoy a family day-out at London’s famous toy museum: there will be Easter crafts, egg hunts and storytime for the little ones. Free entry. And for the practical bit…. STAY: you can find hotels on ebookers.ch. A very good site to find out more about the best baby and child-friendly hotels in London is www.luvaville.com. 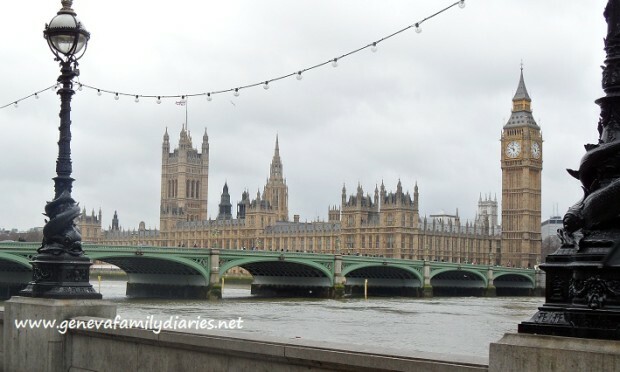 Local expat mum Sara visited London with her family two years ago and she highly recommends the K+K Hotel George. The hotel organized a fantastic egghunt in their beautiful gardens, so check it out as well! EAT: there are so many fab restaurants in London where children are welcome that it’s impossible to list them all here. My little ones’ favourites are Wagamama for noodles, YO! Sushi for fast Japanese, Giraffe for yummy kids menus and Zizzi, Carluccio’s or Strada for pizza & pasta. You can find more child & baby-friendly restaurants here and on Delicious magazine as well. ACTIVITIES: for all child-friendly activities and museums in London you must, of course, check out Time Out London – bedtime is the limit! Hi Jacqueline, thank you for your comment – yes Easter at the London Dungeon sounds like great fun and a bit different 🙂 Have a wonderful Easter !